The koala (Phascolarctos cinereus) is an arboreal herbivorous marsupial native to Australia, and the only extant representative of the family Phascolarctidae. The koala is found in coastal regions of eastern and southern Australia, from near Adelaide to the southern part of Cape York Peninsula. Populations also extend for considerable distances inland in regions with enough moisture to support suitable woodlands. 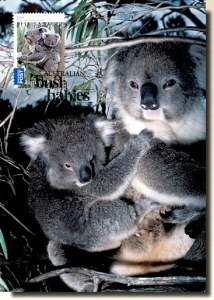 The koalas of South Australia were largely exterminated during the early part of the 20th century, but the state has since been repopulated with Victorian stock. The koala is not found in Tasmania or Western Australia.